The legacy of the Boyer Candy Company, Inc. "Play Money" lives on and continues to be redeemed for a variety of prizes. The "Play Money", which acts as the tray for the creamy, marshmallow-coconut filled Mallo Cup, can be found in each count goods candy bar. Not only are consumers getting their candy, but they're also receiving a little extra bonus. 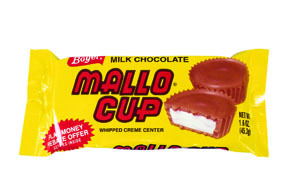 Since 1936, The Boyer Candy Company has been producing Mallo Cups, the first cup candy produced in the United States. These delicious cups continue to draw a loyal following not only for their creamy centered confections which provides a unique taste, but also for the little extra surprise inside of every bar pack known as "PLAY MONEY". The "Play Money" also known as Coin Cards are the printed trays on which the candy sits. The "Coin Card" has a value that varies from 5 to 50 points (that's the big score!). When consumers save 500 points, they send their coin cards back to the plant which is nestled in the Allegheny Mountains location of Altoona Pennsylvania where they are counted and rewarded by the "Malloteers" in the mailroom. The loyal customers have the opportunity to be rewarded with several different prizes which are found in our company's coin card catalog. In the beginning the prize consisted of a box of candy, however as years passed the prize was changed to a Marty Mallo Check for $1.00. In 1986 the program was expanded to include t-shirts, hats, tins of candy, and watches. In 2009 it was once again expanded to include games, backpacks, and the Boyer Character Dolls: Marty Mallo, Patty Peanut Butter Cup, and Sam Smoothie. Surprisingly, over 5 ½% of all coin cards are redeemed. In 2004, one customer sent in 100,000 points. Not only was he sent $200 in redemption checks, but his coin cards were also placed on display in our plant (it was a record). Now that's a lot of candy! Due our loyal customers and the nostalgia of the past, Boyer's Play Money Program continues to bring smiles and childhood memories to its customers. 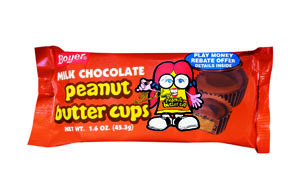 For more information on the Play Money Program please visit our website at http://www.boyercandies.com. High resolution photos and additional jpegs are available upon request. "Play Money"Coin cards that can be redeemed for a check or several Boyer prizes. Coin Cards value between 5 and 50 points. 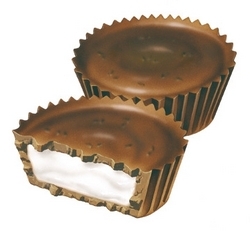 Mallo Cup - creamy marshmallo, coconut center with milk chocolate coatingCoin Card Found Inside! 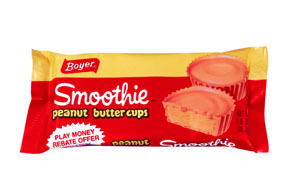 Smoothie - Peanut butter center with a butterscotch candy coating containing crushed up peanutsCoin Card Found Inside! Peanut Butter Cup - peanut butter center with a milk chocoate coatingCoin Card Found Inside!